With this quick Random.access Retrospective featurette, we'll be checking out the Kiki Kaikai series, which really gained more popularity outside of Japan when it was released on the SNES as "Pocky & Rocky". Starring a shrine maiden named Sayo-chan (or "Pocky", in an Americanized creative twist), she'll need to save her homeland from the invasion of ghosts and gods with the aid of scrolls for tossing and a wand for waving. Most Kiki Kaikai games have actually been released overseas, so we've been able to bask in its Japanese glow. It's Pocky time! 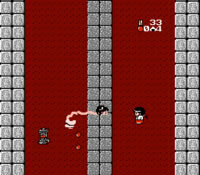 The character Sayo-chan, a youthful priestess, was introduced for the first time in Kiki Kaikai for the arcades in 1986. Her sole duty was to save the Seven Lucky Gods from a group of demonic creatures, and she could only do it by traversing Japan, defeating a variety of unusual Japanese creatures. In the end, she must face off against Orochi, the legendary snake of Japanese lore, to free the final god. Kiki Kaikai, like every game of the series, is a top-down action game. Sayo-chan can move in four different directions, using either her rod of purification or by shooting o-fuda scrolls to fend off nasties. By finding special papers, Sayo-chan can upgrade her weaponry to better defend herself. Each stage also ends with a boss battle. Unfortunately, Sayo-chan can only take one hit before she falls prey to death. For its time, it was pretty novel, although modern gamers may be put off a bit by its control antiquity. Kiki Kaikai was ported to the MSX2 (a Japan-exclusive computer system) the following year, as well as to the PC Engine (Japan's TurboGrafx-16) in 1990. Both try to be faithful to the arcade counterpart, and for the most part, they succeed, even though the screen dimensions of most television sets do not match those of the original Kiki Kaikai arcade monitor. Kiki Kaikai was also released in the Taito Memories Vol. 1 collection for PlayStation 2 and Taito Pocket Memories for the PSP, both Japan-only titles. North American and European gamers, however, could get a hold of this game courtesy of Taito Legends 2 for the PlayStation 2 and Xbox, as well as via Taito Legends: Power-Up for the PSP. The Famicom Disk System, that lovable Japanese Famicom add-on with the 3.5" support, received its own port of Kiki Kaikai as "Kiki Kaikai Dotouhen" ("Mysterious Ghost World: Surging Waves Edition"), this time adding a two-player mode. Gamers were introduced to Miki-chan, Sayo-chan's companion. (There was a two-player mode in the original Kiki Kaikai for the arcades, but both players alternated solely with Sayo-chan, likely causing a bit of confusion.) Players can endure four hits before dying; a life meter helpfully keeps you abreast of your vital stats. Kiki Kaikai Dotouhen also added time as a factor, switching between day and night at regular intervals. In a strange move, developer Taito opted to make Sayo-chan's supply to card projectiles limited, making your journey a little more frugality-based. Unlike the original Kiki Kaikai, the first sequel for the SNES was not developed by Taito; the reins were instead handed over to Natsume, who is now well-known for its Rune Factory and Harvest Moon series. It was also the first game of the series to make it outside of Japan, under the new name of "Pocky & Rocky", with Sayo-chan adopting the name "Pocky" (and we're not sure how they came to localize it that way). A new character was introduced, Manuke the tanooki (not-so-cleverly anglicized as "Rocky" the raccoon), removing the need for Miki-chan. 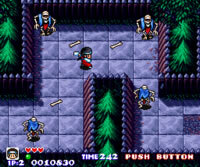 Graphical and sound improvements aside, Pocky & Rocky offered fast-paced two-player simultaneous play, providing a new level of teamwork against the now returning demons. Pocky's purification rod and o-fuda card attack remain intact (though overseas, the rod is now merely a magic stick); Rocky can fire off leaves or use his tail to fend off foes. Rocky can also turn into a statue to remain temporarily invincible, just as the mythical tanooki could do. 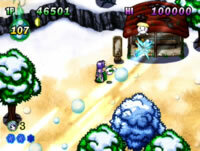 Characters can also slide and use bombs to destroy everything on screen. Weapon improvements are now achieved by picking up orbs, rather than parchments. This game is a solid improvement over the original Kiki Kaikai, and it would help in greatly increasing the popularity of the series worldwide. Though a grand festival is about to take place, demons have decided to return for even more mischief, this time kidnapping Princess Luna! It's up to our heroes, Pocky (Sayo-chan) and Rocky (Manuke) to rescue her. In Pocky & Rocky 2, they are not alone: you can choose to bring along Rocky or one of your other friends, Bomber Bob (Takuan) or Little Ninja (Shinobi). Along the way, additional characters will help you fight, such as a scarecrow or even a robot. Gameplay is more or less the same, although in the single-player mode, the CPU will back you up. Each character has a unique magic ability as well that can aid your endeavours. There are also additional RPG elements -- well, more people will talk to you than ever before, either by running shops or delivering sage advice. You can take several hits; each time Pocky is hurt, parts of her clothing (presumably armor) fly off. 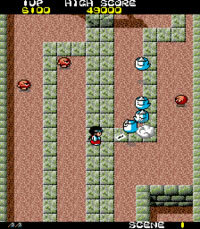 Pocky & Rocky 2 introduced auto-scrolling stages where you ride a dragon or a dog while fending off enemies; these cannot be enjoyed with two players, sadly. The graphics and sound are as snappy as ever, and the game even includes a tutorial level (don't worry, it's skippable) for beginner players. Pocky & Rocky 2 may arguably be the best of the series. A portable Pocky & Rocky game was developed by Altron and released in 2001 by Natsume. A Hydra that Pocky had captured finally broke free of its confinement and started raining hell all over Japan. Pocky, Rocky, and Becky (the revived Miki-chan from Kiki Kaikai Dotouhen) now must visit seven different areas in an effort to recapture the Hydra. Pocky & Rocky with Becky is modeled more like the arcade game than anything else, complete with one-hit deaths (two hits in North America). 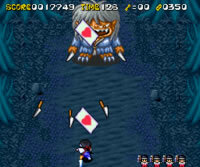 In addition to regular magic stick waving and card tossing, all three characters have unique attack abilities, unlocked by obtaining an ofuda parchment. The screen-wide bomb also makes a return appearance. Though not as spectacular as its SNES counterparts, Pocky & Rocky with Becky is still worth checking out. Kiki Kaikai World 2 was announced in 2007 by a developer called Starfish. Subsequent issues with Taito being absorbed into Square Enix, however, caused the deal to go sour. Luckily, with a sleight of hand and a few character changes, Heavenly Guardian was good to go, with UFO Interactive and 505 Games handling the North American and European releases, respectively, and porting the game to PlayStation 2, instead of just the Wii. Technically, it's not part of the Kiki Kaikai series, but the gameplay influences are crystal clear. Sayo-chan has been replaced with Sayuki, the snow goddess, with Player 2 controlling her sister, Koyuki. Toto the rabbit joins you in single-player mode. The gameplay is very similar, with both players firing off projectiles in eight directions. Scattered power-ups provide some variation in the type of shots fired, similar to the Contra series. Levels are also more open-concept with free scrolling in any direction. The hand-drawn sprites look fairly decent, though the music leaves something to be desired. It's an alright game overall, though it does not eclipse the solidity of the SNES Pocky & Rocky titles. There have been no further Kiki Kaikai games since Heavenly Guardian, and it looks like neither Taito, under the firm direction of Square Enix, nor Natsume is going to revive the franchise any time soon. We can only hope that someday, somehow, Sayo-chan will get to swing that purification rod... er, sorry, "magic stick" at least one more time.